At 13 weeks pregnant, you are entering your last week of your first trimester – congratulations! You are one third of the way toward meeting your new baby and becoming a mother. This is usually a transitional time for many women as they become less nauseous, but to begin to experience other aches and pains along the way. Hang in there – finishing your first trimester is definitely an accomplishment in itself! 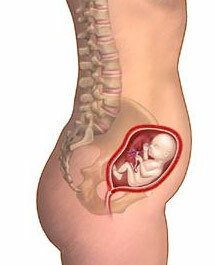 At 13 weeks pregnant, your baby is continuing to grow, now about 3 inches long, but still weighs less than an ounce. The most noteworthy event of the this week is the development of your baby’s face. This is the week when the eyes and ears typically move into place. This week, your baby’s eyes move from the side of its head to the front. Additionally, your baby’s ears will also move into their proper place. While you may not quite recognize your baby’s face just yet, the main parts are finding their place. Your body is preparing for the birth of your baby nearly as much as it is for the duration of your pregnancy. At this early date, your breasts may already be starting to make colostrum. Colostrum feeds your baby, although it isn’t quite milk. Colostrum is rich in both nutrients and anti-bodies, which makes it the perfect first food for your baby. For the first few days after your baby is born, your breasts produce colostrum and then after this initial period, milk. Even if you don’t plan to breast feed your baby, consider trying it for at least the first few days after your baby is born – it will help you recover from your pregnancy and do wonders to keep your baby healthy. Celebrate your 13th week pregnancy! As you finish this week, you finish your first trimester and you have every reason to celebrate. Whether it’s a quiet night at home or a romantic night out, do something that makes you feel good and acknowledges all of the changes that have happened in your body and probably in your life as well. You’ve done a lot of work so far and you will continue to do a lot of work and experience many other changes as your pregnancy progresses, but you’ve reached an important milestone – you deserve to take time out to celebrate!